The Swiss Re Global Cat Bond Total Return Index posted an annualised return of 5.77% for the first-half of 2016, up 1.56% on the annualised return recorded in H1 2015, and reflecting more stable pricing the cat bond coupon return component stayed in-line with the level witnessed in 2015. Global reinsurance giant Swiss Re has released details of the performance of the Swiss Re Global Cat Bond Fund Total Return Index as part of its Q2 and H1 2016 insurance-linked securities (ILS) market update. The index is a market value-weighted basket of natural catastrophe bonds tracked by reinsurer Swiss Re’s Capital Markets division, and reveals that total annualised returns and the price return, in H1 2016, improved compared with the annual return for 2015. Swiss Re explains that the price component return for H1 2016 was -0.02%, so an improvement from the -1.56% witnessed in 2015 and the -1.02% seen in 2014, although still someway off the positive 2.2% recorded in 2013. 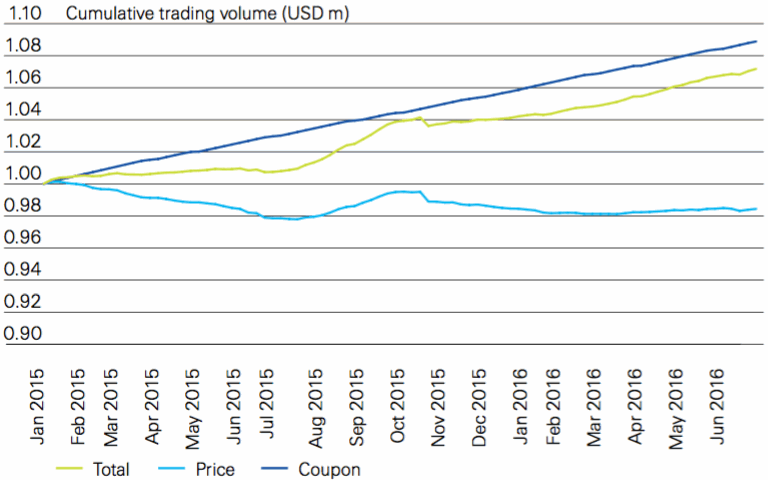 As noted earlier, at 5.79% the coupon return component in H1 2016 remained similar to the 5.86% reported in 2015. Although declines in coupons slowed, this is still a reduction from the 7.11% seen in 2014 and the 8.47% witnessed in 2013. The total return index had an annualised return of 5.77% explains Swiss Re, and while this is an improvement of 1.56% on the annual return recorded in 2015, it’s still lower than the 6.02% and 10.85% recorded in 2014 and 2013, respectively. 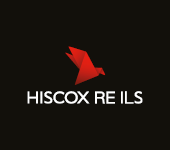 “With a return of -0.02% in 1H 2016 the price index therefore stayed flat, in particular in comparison with 1H 2015, which witnessed spread widening,” said Swiss Re. Owing to the seasonality of hurricane-exposed catastrophe bonds price returns are typically negative during the first-half of the year, says Swiss Re. Adding that absent a large catastrophe event it would expect price returns to rebound towards the end of the year. 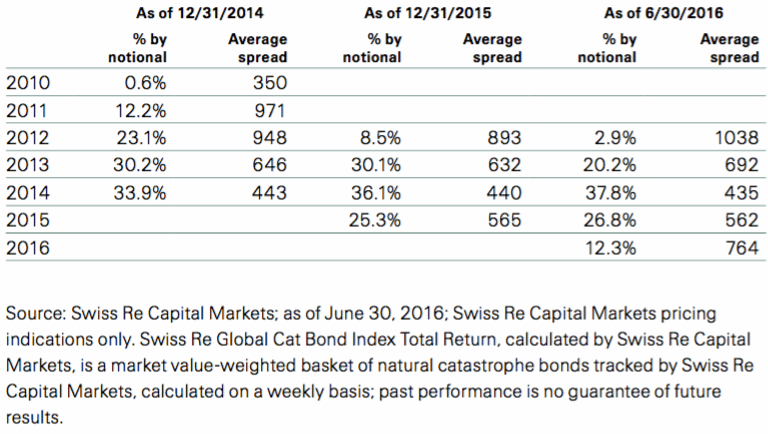 As shown by the above table provided by Swiss Re Capital Markets, newly issued cat bonds during the first six months of the year had higher spreads than the three preceding years, on average. The reinsurer highlights the Class B tranche of Blue Halo Re Ltd. (Series 2016-1) notes from sponsor Allianz Risk Transfer, which offered investors a coupon of 19.75%, the highest yielding note since 2013, says Swiss Re. “Moreover, for bonds included in the index calculation, eight out of the 17 placed tranches in 1H 2016 were issued at a spread level above 700 bps, while only three tranches issued in 2014 and five in 2015 exceeded that level,” explained Swiss Re.